Among open-source relational databases, PostgreSQL is one of the most popular—and the most sought-after by Google Cloud Platform (GCP) users. Today, we’re thrilled to announce that PostgreSQL is now generally available and fully supported for all customers on our Cloud SQL fully-managed database service. Backed by Google’s 24×7 SRE team, high availability with automatic failover, and our SLA, Cloud SQL for PostgreSQL is ready for the demands of your production workloads. It’s built on the strength and reliability of Google Cloud’s infrastructure, scales to support critical workloads and automates all of your backups, replication, patches and updates while ensuring greater than 99.95% availability anywhere in the world. Cloud SQL lets you focus on your application, not your IT operations. While Cloud SQL for PostgreSQL was in beta, we added high availability and replication, higher performance instances with up to 416GB of RAM, and support for 19 additional extensions. It also joined the Google Cloud Business Associates Agreement (BAA) for HIPAA-covered customers. Cloud SQL for PostgreSQL runs standard PostgreSQL to maintain compatibility. And when we make improvements to PostgreSQL, we make them available for everyone by contributing to the open source community. Throughout beta, thousands of customers from a variety of industries such as commercial real estate, satellite imagery, and online retail, deployed workloads on Cloud SQL for PostgreSQL. Here’s how one customer is using Cloud SQL for PostgreSQL to decentralize their data management and scale their business. OneMarket is reshaping the way the world shops. Through the power of data, technology, and cross-industry collaboration, OneMarket’s goal is to create better end-to-end retail experiences for consumers. Built out of Westfield Labs and Westfield Retail Solutions, OneMarket unites retailers, brands, venues and partners to facilitate collaboration on data insights and implement new technologies, such as natural language processing, artificial intelligence and augmented reality at scale. 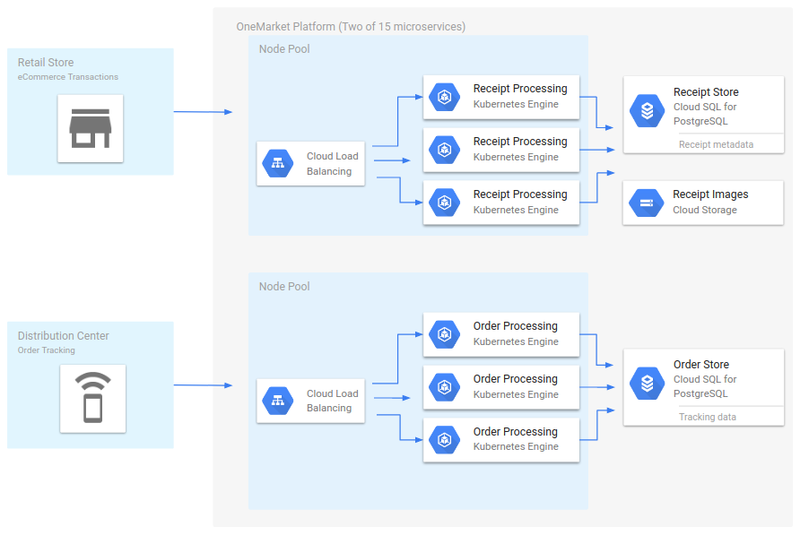 To build the platform for a network of retailers, venues and technology partners, OneMarket selected GCP, citing its global locations and managed services such as Kubernetes Engine and Cloud SQL. OneMarket’s platform is comprised of 15 microservices, each backed by one or more independent storage services. Cloud SQL for PostgreSQL backs each microservice with relational data requirements. The OneMarket team employs a microservices architecture to develop, deploy and update parts of their platform quickly and safely. Each microservice is backed by an independent storage service. Cloud SQL for PostgreSQL instances back many of the platform’s 15 microservices, decentralizing data management and ensuring that each service is independently scalable. Because the team was able to focus on data models rather than database management, developing the OneMarket platform proceeded smoothly and is now in production, reliably processing transactions for its global customers. Using BigQuery and Cloud SQL for PostgreSQL, OneMarket analyzes data and provides insights into consumer behavior and intent to retailers around the world. Connecting to a Google Cloud SQL database is the same as connecting to a PostgreSQL database—you use standard connectors and standard tools such as pg_dump to migrate data. If you need assistance, our partner ecosystem can help you get acquainted with Cloud SQL for PostgreSQL. To streamline data transfer, reach out to Google Cloud partners Alooma, Informatica, Segment, Stitch, Talend and Xplenty. For help with visualizing analytics data, try ChartIO, iCharts, Looker, Metabase, and Zoomdata. Sign up for a $300 credit to try Cloud SQL and the rest of GCP. You can start with inexpensive micro instances for testing and development, and scale them up to serve performance-intensive applications when you’re ready. Cloud SQL for PostgreSQL reaching general availability is a huge milestone and the best is still to come. Let us know what other features and capabilities you need with our Issue Tracker and by joining the Cloud SQL discussion group. We’re glad you’re along for the ride, and look forward to your feedback!